The Cocoa-yielding plant is a tree varying from fifteen to forty feet in height. The main stem or trunk is much twisted and knotty, from which the branches stand out almost horizontally. The bark is thick, rough, and of a cinnamon-brown color. The chocolate tree is a native of Mexico, Central America, Brazil, and other South American countries. It is now extensively cultivated in most tropical countries of both hemispheres. The West Indian islands have numerous large plantations. It is also found in botanic gardens and greenhouses. There are several cultivated varieties. 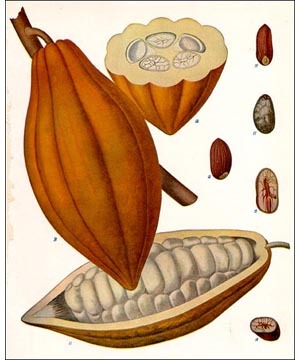 The cocoa or cacao-yielding plant must not be confounded with the cocoanut palm or the coca-yielding plant. There is perhaps no food substance which is more universally liked than chocolate. Mothers have no small amount of trouble in hiding the household chocolate from the children. With the omnipresent penny-in-the-slot machine, more pennies are credited to it than to the chewing gum. The housewife and baker use it very extensively with chocolate cake. The confectioner uses it very freely, to the great delight of the children. The principal use to which cocoa is put is in the preparation of a beverage. For this purpose, enormous quantities of chocolate, cocoa broma, and hulls are consumed annually. The drink is prepared by thoroughly triturating the desired amount of chocolate, cocoa, or broma with a small quantity of water, then stirring this into the necessary quantity of boiling milk or water, and boiling for a few minutes, with constant stirring. The oil present gives the drink great nutritive value. Cocoa butter, which resembles tallow in consistency and appearance, is used in medical and pharmaceutical practice as a salve or pomade for external application in eruptive diseases, as scarlet fever, etc. Cocoa also finds extensive use in medical practice, though it has no marked curative properties.